Oh, where to begin? As reported here and discussed here, Karl Rove –“Bush’s brain” and the most evil man in the so-called Free World– was the bloated turd who leaked the identity of CIA operative Valerie Plame to “douchebag for freedom” (in John Stewart’s words) Robert Novak. The disclosure of the identity of an undercover agent is, I am told, more than a felony under US law; it’s high treason. In a country in which speaking out against the war is considered treachery and where burning a flag is likely to get you lynched, I wonder how the wingnuts in the White House will react to Rove’s admission that he has committed serious treason during war-time. I know exactly what will happen: absolutely nothing. Because US Right Wing, thine name is hypocrisy. Note that the only person yet to go to jail for this scandal is reporter Judy Miller, because she refused to name her source; she, apparently, was the only one capable of keeping a secret. All right then, how best to broach this sensitive topic without getting flamed by the oversensitive crowd? Let’s just jump in, then, okay? Like most of you, I have family and friends in London who were put at risk during the recent terror bombings. Like many of you, I recently stood in the very spots where some of the bombs went off. Like all of you, I wish it hadn’t happened; I wish no one had got hurt; I wish no one had got killed. However, I’m tired of this. 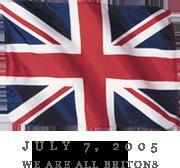 This whole “Today We Are All Britons” meme is a little sickening. When British and American planes were dropping hundreds of thousands of explosives on Baghdad, killing thousands of Iraqis, many (if not most) of whom were innocent civilians, where was the “Today We Are All Iraqis” sentiment? When hundreds of innocent Afghan shepherds had their bodies and property ripped apart by Western ordinance, where were these sensitive, feeling bloggers with their “Today We Are All Afghans” icons? But fifty Londoners are tragically, regrettably murdered and the world stops to grieve. Maybe sympathy is only to be reserved for the white folks? (Though many of the London victims were non-white, the world still sees the UK as a white country.) There is a nasty, hypocritical and racist undertone to the global conflict that now surrounds us, and we’d better wake up and acknowledge it. Now, I’m not one to offer the quid pro quo argument that the invasion of Iraq was the direct cause of the London bombings. After all, Islamist terrorists have been targeting Westerners long before the invasion: the attack on the USS Cole, the first World Trade Centre bombing and, of course, 9/11. But the war in Iraq was an accelerant. My argument has always been that terrorists (i.e., those who actually plan, commit and fund the attacks, not their families or innocent neighbours) are criminals and need to be captured or even killed. But addressing the source of their rage is not appeasement, it’s reasonbleness. Specifically, the West must cease propping up dictators, stop directly meddling in the domestic affairs of foreign countries, and remove our military bases from foreign soil. Having said that, the standard Bush/Blair apologists claim that the London bombings were an “act of war” rather than a criminal act. But I thought Britain was already at war? If these two precepts are to be accepted, then the bombings were not terrorist acts at all, but were rather a war-time battle, and in fact were in response to the invasion of Iraq. Pick a characterisation, wingnuts, and stick to it.